Reading in a second language can be a challenging activity, both to study and to teach. Students have no control over the language that is presented to them in a text (which was written by someone else and is unfamiliar from beginning to end, on first sight). 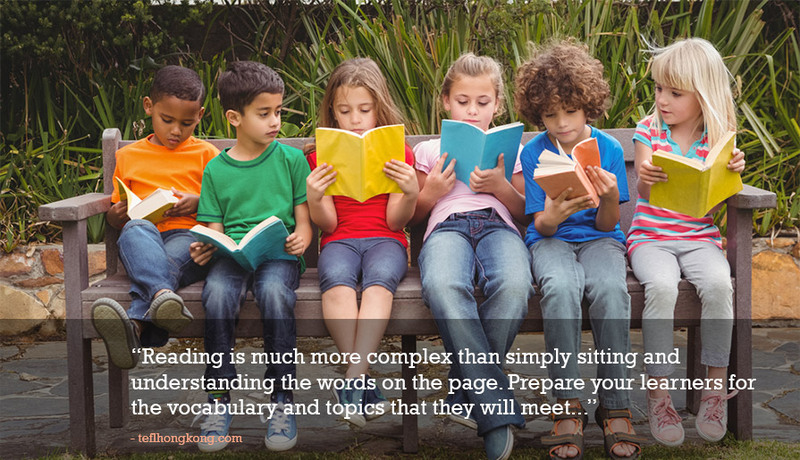 For teachers, it is difficult to control the speed of reading among students, and almost impossible to know how much of the text will be understood by different students in the room, as every learner has a different vocabulary and may process the information very differently. In order to teach reading effectively, especially for timed or assessed reading work, it is important to systematise the learners’ reading processes while allowing the freedom for students to process the information they read to some depth and with clear purpose. This article will look at four ways that this can be achieved, through some simple teaching considerations for reading lessons. As mentioned above, it is difficult to know how many of the words in a text will be understood by a group of learners. This can be brought under control by ensuring that some pre-teaching work is done before the reading activity starts. To pre-teach effectively, run through the text you want to use before the lesson, and pick out any words or phrases which stand out as challenging for the average level of your learners. This may result in a long list; if so, look at how these vocabulary items sit in sentences. Are there clues to their meaning which appear around the words themselves? Or is the word used out of context, meaning that if a student does not already know the meaning, they will have no way of guessing as they read? If this is the case, then that word or phrase is worth presenting to the class before you even show them the text. Choose a list of 5-10 words like this (depending on the length of the class you are teaching) and spend 10 minutes at the very beginning of the class presenting and building example sentences with them. This ten minute pre-teaching stage will save twenty minutes of fielding questions from demotivated students who do not understand key ideas later in the lesson. On first meeting with the text, remember that the students are coming to this significant amount of information cold, no matter how much time you have spent preparing the lesson. For this reason, it is important to ease them in to topics and themes from the text before they start to read. This is known as ‘activating schemata’ – basically, preparing their topic-brains for the information they are about to read. Research shows that students take on new information more readily if they have thrown related topics around before they tackle the new information, so a short discussion, topic-focused question or introduction of a relevant picture prompt can go a long way to help students to deal with an unfamiliar text. A useful first task to warm learners up to a text is to ask them to pass their eyes super-quickly over the entirety of the text, starting at the first word of the first paragraph, and finishing on the last word of the last paragraph, in a ten-second time limit. Follow this by asking students to call out any words that they saw as their eyes raced through the text. Most likely, they will have picked out content words: nouns, verbs and adjectives that they recognise. However you introduce a reading text, it is essential that learners have a clear purpose for reading. This means that they need to fully understand the task they are being asked to perform with the text before they start to read in detail. Take a few minutes to go through the questions, or to confirm the type of information they will be looking for, just to set a clear reason for working through the text itself. ‘Read this article about recycling’ is not a clearly purposeful reading task, and will not lead to meaningful content being processed in a useful way by students. The questions are ‘read how?’, ‘read why?’ , ‘read for what?’. If students know the answers to these questions, they will be more engaged and productive during their reading activity. With more complex reading texts, two or more readings with different information goals can highlight different aspects of the text. Reading once for information and again for writer’s attitude can bring out different ways of processing the same information from the page. Other purposes for individual reading tasks can be reading to look at character development, argumentation, importance of points, text structure or even to highlight the use of specific grammar or vocabulary items. Working with a text for different purposes in different lesson stages can make reading more generative, and lead to deeper, more critical processing of information. An effective vocabulary task which can be performed towards the end of a reading lesson, after the text is better understood by learners, is to go back to your original lists of words and phrases (from point 1), above), and ask students to guess the meanings of the vocabulary items which are well-contextualised (i.e. the ones which you chose not to pre-teach at the beginning of the lesson) and ask the learners to guess their meanings from the surrounding sentences and ideas. This ‘vocabulary in context’ approach can build confidence with new texts and leads to greater reading fluency. As a final point, when students are answering questions about what they read, a good technique is to get them thinking about why they chose the answer that they did, what they based this idea on, or why they think that way, based on information from the text. Encouraging students to justify their ideas from specific sections of a text can increase engagement with the ideas in the writing, and helps them to confirm their answers based on real evidence rather than unjustified feelings or guesswork. This is another effective way of building critical thinking through reading work. All in all, reading is much more complex than simply sitting and understanding the words on the page. Prepare your learners for the vocabulary and topics that they will meet before their first contact with the text, and make sure that they are reading with purpose. Design tasks that force them to engage with the ideas in the text in different ways, and they will develop much deeper comprehension and critical-thinking skills with any text that is presented to them.